Islam is dying. If there was ever a dead-end ideology, it’s Islam. A top Saudi Cleric has described ISIS as the No. 1 enemy of Islam. Islam itself is its own worst enemy. It’s an ideology with no future. The earliest days of Christianity saw a similar manifestation of evil. The apostle Paul participated in killing the first Christian martyr (Acts 7:54-8:1-2) and later became Christianity's greatest convert (9:1-9). The persecution did not stop with him but was later joined in by Rome. The Roman Empire is a distant memory, and the remnants of its rule are decaying tourist attractions. You can’t build a civilization on the decapitated heads of your enemies. Radical Islamists are using fear to keep other Muslims in line. Such a religion cannot long maintain itself until a time of quiet rebellion sets it. If this is Islam, many Muslims reason, they don’t want any part of it. They realize that there’s always the possibility that one day they will become an enemy of Islam and lose their head. It shouldn’t surprise us that Muslim nations don’t want any worldview competition. Churches and Christian missionaries are banned. But none of the atrocities has stopped an Islamic defection to Islam’s sworn enemy – Christianity. According to Al-Jazeerah’s interview with Sheikh Ahmad Al Katani, the president of The Companions Lighthouse for the Science of Islamic Law in Libya, in every hour, 667 Muslims convert to Christianity. Millions of Muslim converts to Christianity celebrated Christmas throughout the world, according the reports of the various missionary organizations and news media. The Salem Voice Ministries [is] evangelizing Muslims in India and many other Muslim nations. There are about 500 evangelists ministering among Muslims in different African, Middle East and Asian countries. A vast number of Muslims are finding the truth and attaining Salvation of Jesus Christ day by day. 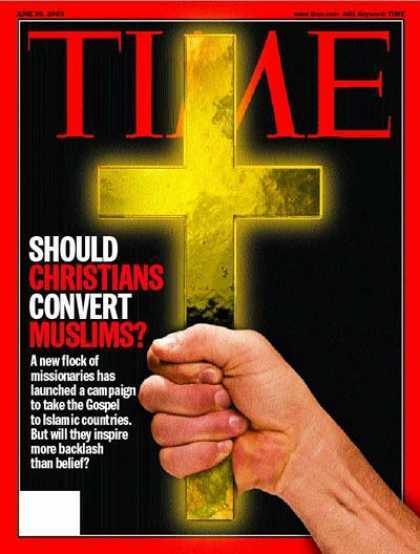 ‘More Muslims converted to faith in Jesus Christ over the past decade than at any other time in human history. A spiritual revolution is underway throughout North Africa, the Middle East, and Central Asia. As a result, a record number of ex-Muslims are celebrating Christmas this year, despite intense persecution, assassinations, and widespread church bombings.’ These are the words of Joel C. Rosenberg, the author of the New York Times best selling political thriller. Everyday, 16,000 Muslims convert to Christianity. Every year, 6 million Muslims convert to Christianity. Al-Jazeerah has since removed the interview and details.